Nawaz Sharif who has been elected as the PM of Pakistan for the 3rd term has invited Indian PM Manmohan Singh to attend the oath-taking ceremony. See even the PM of Pakistan can foresee our future! 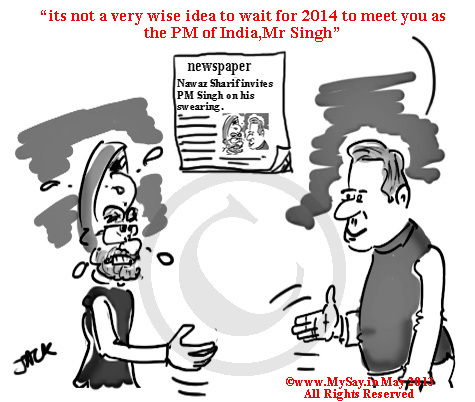 Ha ha ha.Sharif knows where will be Mr.Singh in 2014.
really nice…such intelligent messages through such a humorous art. Love it!! Suppa Duppa Like Richa !! I insist you carry on with comic strips dear . If the first one was so humourous I am sure this is just the beginning ! I thank Almighty for making my circles and lines a reason to ignite the hidden talent already inside you! I am inspired with the way you picked up .. looked for tools and bang – came up with your very first strip in almost about 10-12 hrs I suppose. PM meets PM! Great cartoon! Manmohan should not let go of this opportunity as after awhile he won’t be getting these invitations anymore! I hope Manmohanji does not fall into the guile of Nawaz Sharief’s bus politics which he successfully tried on Atalji. ‘Takhta-palat’ is on the cards!!! Lets see! 2014 is not that far away. As I present you this award I wish you have a firm grip!! I am thankful to you dear Kriti for that kind gesture… For considering me worthy enough for the award. 😀 hahaha ! million dollar question Suresh Ji 🙂 thanks for dropping by ! Yes definitely that could be the case! 😀 thank u dear !!! Well manipulated through the thought and doodle ! Forget Mr. Singh, are you sure if Nawaz Sharif will be there in 2014? You do these so well.